It is very challenging to eat healthy when it is a holiday party. One has to attend a string of parties like corporate parties, family parties, social events and much more. 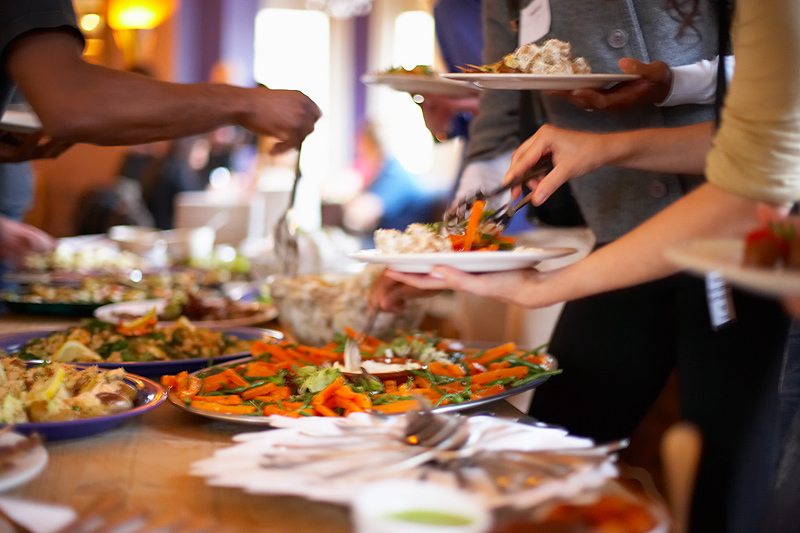 It is true that you must eat in a controlled manner in the party, but being indulgent in one party will not derail you from the healthy eating habits. The major food guilt comes when you eat too much for weeks during the festive season. You may follow some simple tips to avoid feeling deprived and still keep it real. Decide whether the event is just a snacking event, a meal or a facetime. If there will be alcohol, you must decide on the quantity of drink you are deciding to drink. For a multi-course meal, just stick to one drink. If you want, drink smaller quantities of multiple drinks. Before you step out of your home, do eat some snacks. This way you enter the venue with a clear head and end up avoiding much of cravings for fatty food. Besides, the smell of the food and alcohol reaches your head more quickly when the stomach is empty. Choose healthy items in the party like some soup, a piece of sandwich, sliced veggies, etc. To feel fuller and to eat less, you must prioritize protein. Do not go for the wrapped pastry, but rather choose lean protein. You may try out shrimp skewers, roast beef, smoked salmon. Added to this, reach out to the vegetable counter and add some fiber food to your plate. When in the party, you may avoid the items that you eat generally. For example, if you know that there is a delicious chocolate cake slice to be eaten, you can avoid the dinner bread. Avoid eating cookies and other stuff. You must avoid parking yourself to the cheese and cracker counter while you should wander around and converse with other guests. This will distract your attention and prevent you from eating too much. It will be good if you stay on the other side of the room where there are no Munchables. You may alternate alcoholic drinks with club soda or water to avoid the hangover. Do not worry about other people who might give you a hard time when you are not drinking. Well, the world is too busy and no one minds what’s there in your glass. It is important not to be driven by others who are loading up on drinks and foods. Rather, you should feel happy about your healthy eating choices. If you can control your cravings to an extent, it will help your body at the end. Besides this, it is also important to have a look around the food items and then select any. Eating too much in the party can make you regretful at the later stage. Stick to the food items that you normally cannot eat at home. Being strategic about alcohol also helps.